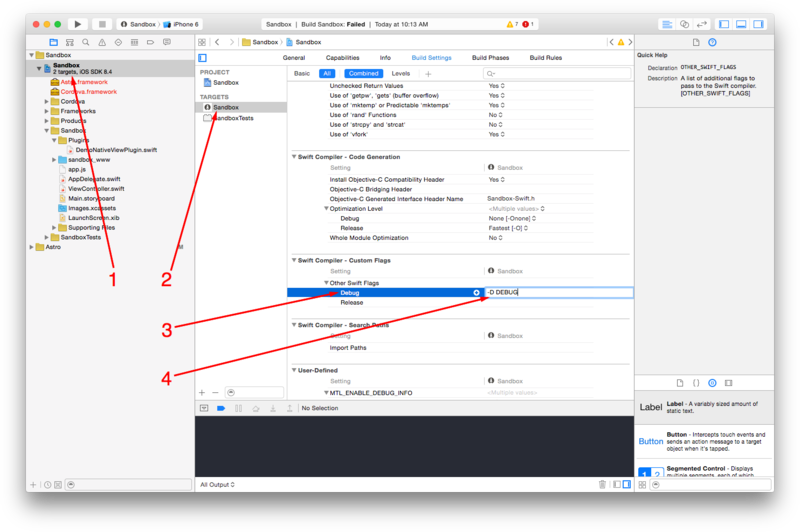 Safari Web Inspector Guide provides steps to attach desktop Safari to an iOS application's web views or worker. Remote Debugging on Android with Chrome provides steps to attach desktop Google Chrome to an Android application's web views or worker. At times it is useful to use compiler flags to conditionally run some code in one build configuration, but not any other. Astro includes two compiler flags: DEBUG and RELEASE to allow only running code in a development (DEBUG) or release (RELEASE) build. Select the main app target (typically named the same as your project) and select Build Settings. Find the section "Swift Compiler - Custom Flags". Expand the "Other Swift Flags" entry and select the "Debug" row. Once its selected wait a second and then click in the right column to begin editing the flag. Type in the new flag value prefixed with "-D" (eg. "-D DEBUG") and hit <Enter>. Please Note: Use of conditional code should be kept to a minimum. It is really easy to write some code in one conditional but forget about the others and leave the code in a broken state.